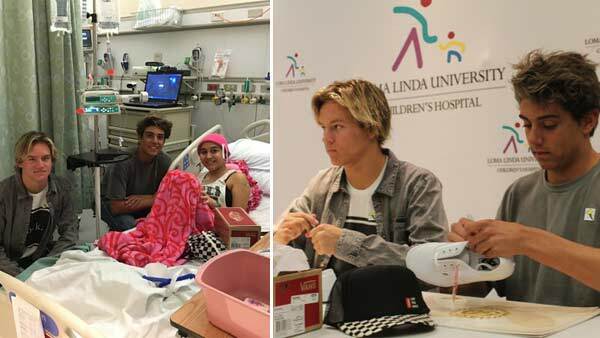 LOMA LINDA, Calif. -- The teens from the viral video "Damn Daniel" are using their newfound fame to help brighten the days of sick children in Southern California. Daniel Lara, who was depicted in the video, and the voice of the video, Josh Holz, have skyrocketed to fame after the video was posted on Feb. 15. The Riverside Poly High School students recently made an appearance on the "Ellen" show, where it was announced that Vans was giving Daniel a lifetime supply of shoes. The duo decided to drop by the Loma Linda University Children's Hospital to give shoes to patients and to spend time with them. Josh tweeted that it was the "best birthday ever." The teens have been giving back to the community after their video went viral. After their last interview with ABC7, Daniel and Josh went to spend a few moments with a group of children with autism. Even with all their charitable contributions, the "Damn Daniel" sensations are keeping busy, as they recently appeared in Weezer's new music video "California Kids." There's even a "Damn Daniel" app now.